Commander, Fleet Activities Sasebo (CFAS) co-exists with the host nation's Japanese Maritime Self Defense Force (JMSDF) and is located on Japan's southernmost island of Kyushu. 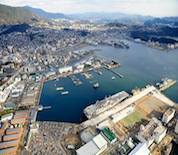 Sasebo City is roughly a 90 minute drive from Fukuoka City which is Kyushu's largest city. Fleet Activities Sasebo continues to support ships of the U.S. Seventh Fleet. Service Force ships as well as mine sweeps make Sasebo their homeport. U.S. Fleet Activities Sasebo provides logistic support to the expanded Seventh Fleet. Sasebo is currently home to Commander, Amphibious Squadron Eleven and assigned ships: USS Essex (LHD-2), USS Harpers Ferry (LSD-49), USS Denver(LPD-9), USS Guardian (MCM-5), USS Patriot (MCM-7), USS Tortuga (LSD 46) and some 5,000 Americans as part of U.S. forward deployed naval forces.